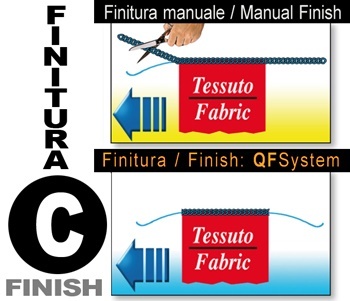 The QF SYSTEM (as Quick Finish system), is a new Complett patent integrating into a linking machine several combinations of automatic finishing after the linking process (such as lock-up of start and finish of the seam, separating pieces or cutting the linking chains to specific measures), that would normally be carried out manually. 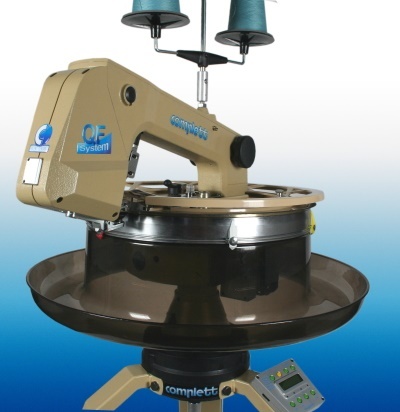 By means of electronic controls, this new machine offers the possibility of saving manual operations, standardise the quality of the chosen finish and also improve the quality of the linking through a programmable electronic tension control that allows, for instance, to get different tensions also during the linking operation. 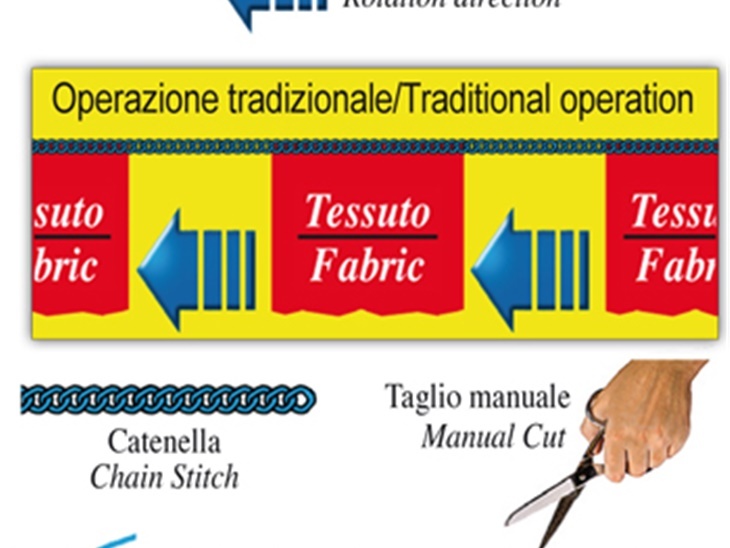 Programme for fully manual operation as a traditional linking machine. 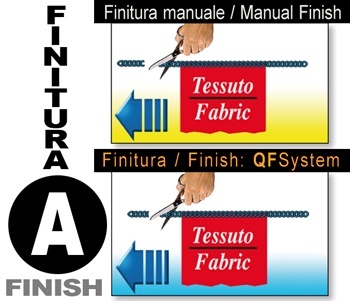 The MANUAL FINISH SYSTEM "A" is therefore followed. 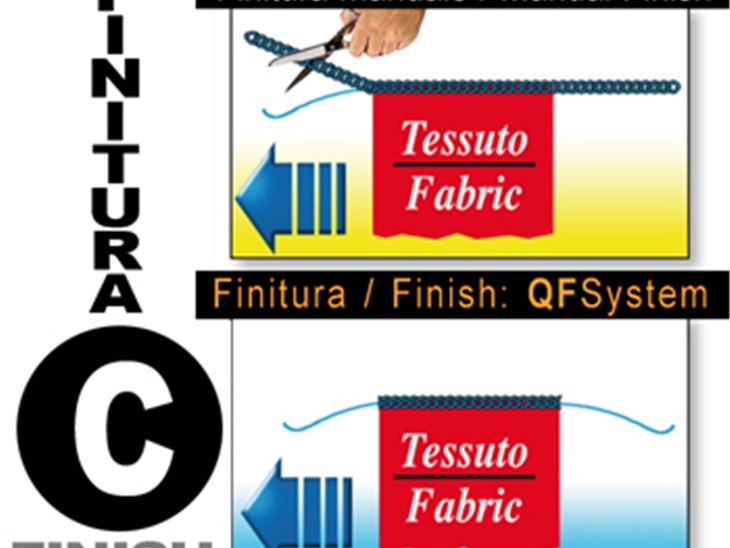 Possibility of using the electronic tension to differentiate the idle chainstitch tension as compared with the seam chainstitch. 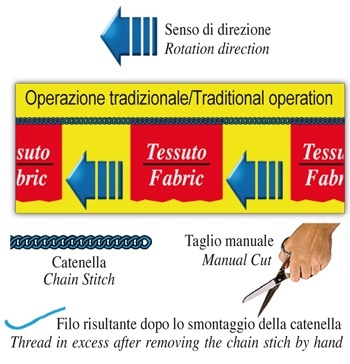 PROGRAMME 2 – FINISH "C"
Programme for semiautomatic operation with possibility of either an automatic cut or of predeterming the thread length that one wishes should come out, with a manual cut. The result will be FINISH "C" of the QF FINISH SYSTEM. 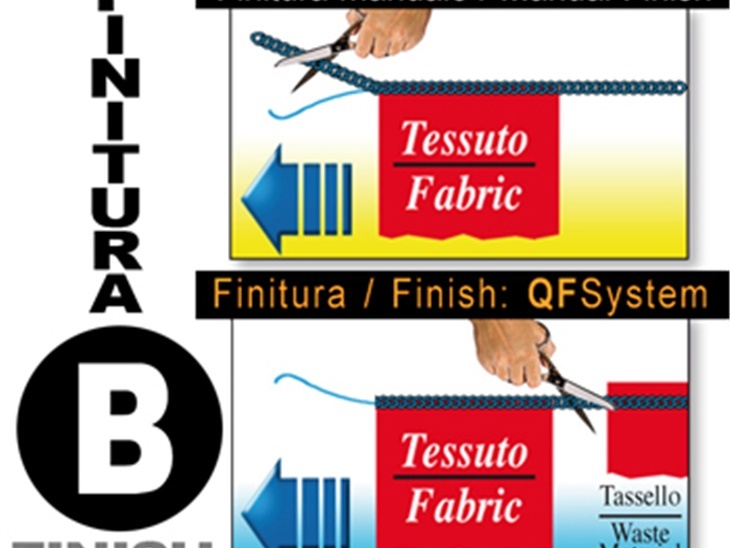 The knot in the thread in the QF SYSTEM is made by the electronic tension. 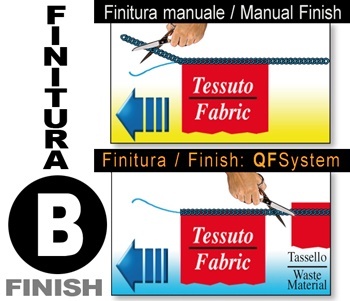 PROGRAMME 3 – FINISH "B"
Programme for automatic operation with the insertion of a strip of fabric (waste fabric) to obtain a FINISH "B" type in the MANUAL FINISH with the advantage of not having to remove the idle chainstitch. 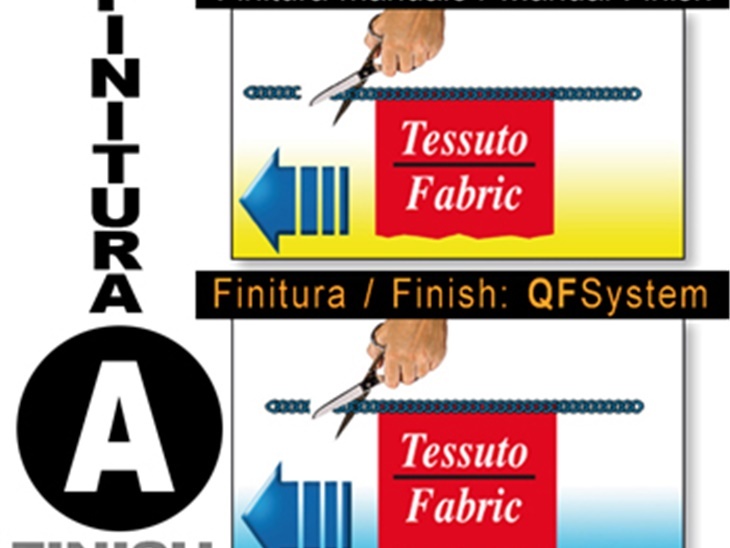 The waste fabric is simply removed by a manual cut. 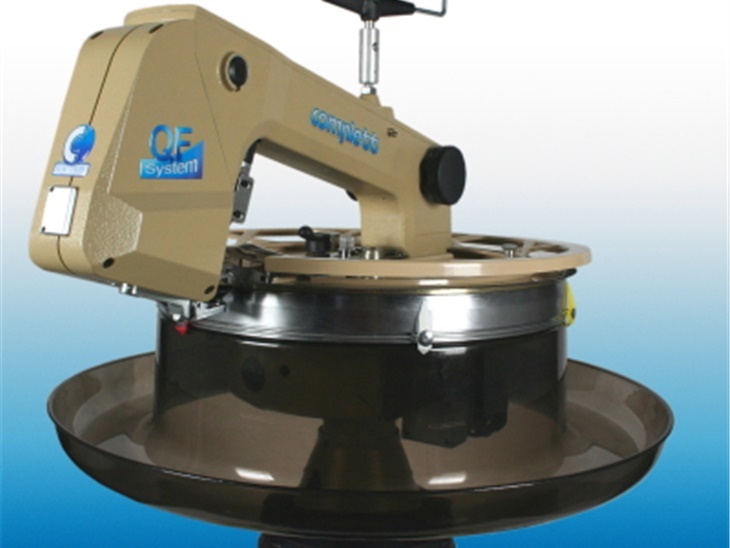 The QF SYSTEM device makes the knot in the thread through the electronic tension before the automatic cut. PROGRAMME 4 – FINISH "C"